Happy Saturday friends! Hope your weekend is off to a good start! Today I'm sharing another quick Valentine's card or just a card to say I Love You. Right off the bat I do need to say that I did use a retired stamp set on this card, because nothing else worked with my design. Hopefully you'll agree with me when you see what I came up with. 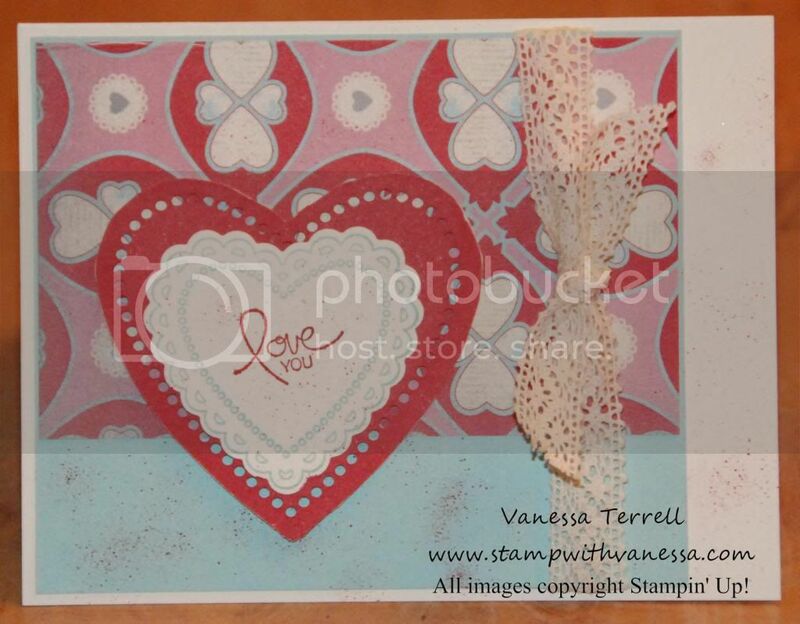 I used the Hearts a Flutter Stamp set and the Hearts a Flutter Framelits with the More Amore Specialty Designer Series Paper and I even pulled out a cool tool (Color Spritzer Tool) to use to add some splatter to my card! I feel like such an artist...lol! Here's my masterpiece....well in my mind anyway! Your blog is adorable - I love it! Thanks for the cute Valentine idea - my kids will be all over it.